KIEV, Ukraine -- Three members of the Ukrainian military have been killed after pro-Russian separatists attacked their post near the eastern flashpoint city of Slavyansk with small arms and mortar fire, a military spokesman said. The reported attack on the post manned by members of the government's "anti-terrorist operation" took place on Saturday despite a government ceasefire, which was extended on Friday until Monday night. 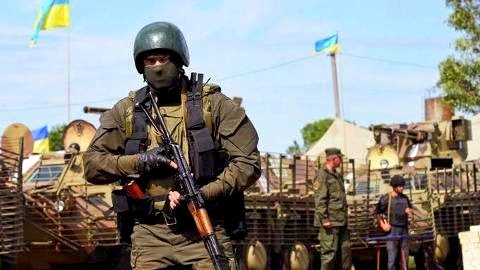 "As a result of the fighters shooting at the post near Slavyansk, three members of the Ukrainian forces were killed and a fourth was wounded," a military spokesman, Oleksiy Dmitrashkovsky, told the Interfax news agency. Hours after the attack, the Organisation for Security and Cooperation in Europe said that pro-Russian separatists in Donetsk had released four of the group's monitors held since the end of May. Two groups of unarmed observers from the European security organisation, totalling eight international monitors and a Ukrainian translator, were captured at roadblocks three days apart in late May. But the second team seized on May 29 in the neighbouring Luhansk province appeared to have been abducted by a different group and negotiations for their release are ongoing. The latest violence in Slavyansk came a day after four soldiers were killed and five wounded as Ukraine's military regained control of a checkpoint in the eastern region of Donetsk that had been earlier taken over by separatists. Ukraine's president, Petro Poroshenko, announced the extension on Friday night, partly at the urging of some European leaders, after returning to Kiev from an EU summit in Brussels where he signed an association agreement. The ceasefire extension was announced in line with a deadline set by EU leaders for rebels to agree to disarm, return border checkpoints to Kiev authorities and free hostages, including the OSCE monitors. Poroshenko also called on Russia to close centres being used to recruit separatist volunteers on its side of the border. The one-week truce had been due to expire on Friday at 7pm GMT, and will now expire at 7pm GMT on June 30, according to the presidential website.